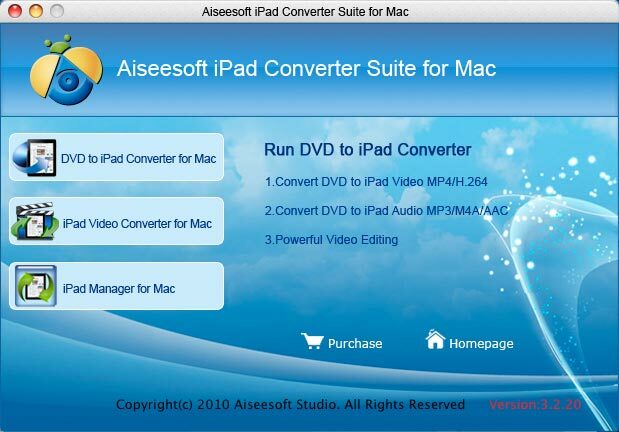 Aiseesoft iPad Converter Suite for Mac combines with iPad Video Converter for Mac, and Aiseesoft iPad Manager for Mac. iPad video converter for Mac can convert all the videos to multiple devices supported formats. In addition, iPad Manager for Mac can both backup iPad audio, video, image files to Mac and import audio, video folders, photos to your iPad. With this best iPad Converter Suite for Mac, you can do a lot of video editing works, such as trimming a clip of video, cropping video size, adding watermark and merging several video files into one file. Work as an iPad Video Converter for Mac to convert all the popular video and audio formats to iPad suitable formats. This Aiseesoft iPad Converter Suite for Mac enables you to get several formats by converting one time. Trim video, crop video and adjust video effect to fulfill your requirement, for example, video Brightness, Contrast, Saturation, subtitle, audio track. Detailed video and audio settings are provided by this best Mac iPad Converter Suite for you to adjust, such as Resolution, Video Bitrate, Frame Rate, Audio Channels, Sample Rate, etc. Provide the fastest conversion speed (>400%), completely support Intel and Powerful PC CPU. Q: How do I get rid of the black edges around my movie? A: You can cut off the black edges around your movie video by the "Crop" feature of our program. Click the "Crop" icon and crop your movie video using the provided methods in the crop window. Q: How can I get the best MP4 quality? A: Please select H264 MP4 format from Format drop-down list. But please note that it will take you more time than to select other output formats. Additionally, it also makes difference when you raise video bitrates and audio bitrates. Q: I just want a clip/segment of my video. Is it possible? A: Surely, after you add the video to the program, please enter the Trim mode, and then start to make a video Clips as per your requirements. Q: I want to capture the current image of my movie, is it possible and how to get it? If you like the current image of your movie you can use the "Snapshot" option. Just click the "Snapshot" button the image will be saved and you can click the "File" next to "Snapshot" button to open your picture. You can select the destination of the picture by clicking the "Preferences" button. As default the captured image will be saved at: C:\Documents and Settings\Administrator\My Documents\Aiseesoft Studio\Snapshot.